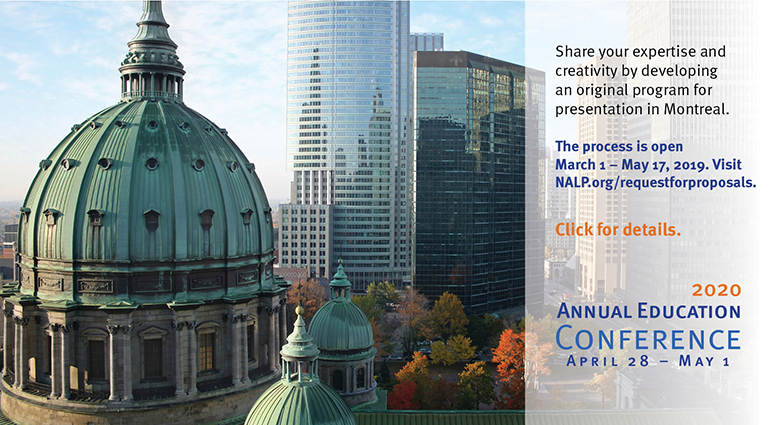 NALP invites you to submit a proposal for the 2020 Annual Education Conference, which will be held on April 28 - May 1 in Montreal. NALP's Annual Education Conference offers innovative and timely information through sophisticated educational programs presented by knowledgeable speakers. These educational programs cover an array of topics to meet the broad needs of NALP’s diverse membership. This is your opportunity to share your expertise and tap your creativity by developing an original program for presentation at the conference. NALP is an association of over 2,500 legal career professionals who advise law students, lawyers, law offices, and law schools in North America and beyond. What brings NALP members together is a common belief in three fundamental things. First, all law students and lawyers should benefit from a fair and ethical hiring process. 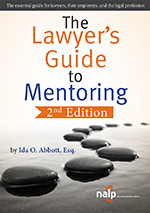 Second, law students and lawyers are more successful when supported by professional development and legal career professionals. Third, a diverse and inclusive legal profession best serves clients and our communities. That’s why NALP members work together every day to collect and publish accurate legal employment data and information, and champion education and standards for recruiting, professional and career development, and diversity and inclusion. For more than forty years, NALP has played an essential role in the success of our members and the lawyers and law students they serve. NALP’s members include virtually all of the ABA-accredited US law schools, most Canadian law schools, and more than 1,000 legal employers. Audiences at NALP programs typically include legal career services professionals, recruitment/personnel administrators, and attorney professional development managers, as well as management and support staff, hiring attorneys, counselors, training directors, diversity directors, law faculty, human resources directors, law school deans, assistant deans, bar representatives, and legal consultants. NALP members are key players in a highly complex, people-centered profession and are well-informed about historical and contemporary topics and trends in legal education, recruitment and law practice management. Women outnumber men in the field of legal career planning and recruiting and, generally, as members of NALP audiences. 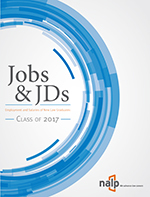 There are NALP members both with JD degrees and without them. NALP members have various levels of experience, ranging from beginning professionals to experienced professionals with considerable expertise. NALP members appreciate challenging topics and are noted for their high expectations. They especially appreciate educational programs that offer concrete ideas that can be adapted for and implemented in their organizations. The proposal form will ask you for a program description, learning objectives, and instructional methods. In providing this information, please provide enough detail so the planning committee can understand how the session will be structured and what key issues will be covered. All proposals must be submitted using this online system. SPECIAL NOTE: Individuals submitting proposals with multiple speakers should contact everyone included in the proposal to verify their interest and commitment in participating before submitting the proposal. It is important that panelists be able to attend the conference in Montreal, and that they are willing to participate in the program. When contacting potential speakers, be sure to indicate that the program is in the proposal stage only, and that final decisions about program acceptance will be made by the conference planning committee, with notification by July 31, 2019. If you have a situation where it is not appropriate to contact and confirm all possible speakers prior to submitting the proposal, you will need to describe those circumstances in the proposal. Preference will be given to proposals where all speakers are confirmed. Note: In recent years we have had a very high response rate of quality programming proposals through our RFP process. For the 2019 conference, about one half of the proposals received were accepted. We therefore encourage you to review these guidelines carefully to ensure your proposal is a serious contender. •	All speakers must commit to the presentation of a program at designated times during the conference, from April 28 - May 1 in Montreal. NALP has determined that programs with more than four speakers are ineffective. Please limit your proposal to not more than four speakers, which includes a moderator as needed. NALP has determined that online member surveys are not an effective way to prepare for a conference presentation, and therefore strongly discourages the use of NALP member surveys to gather information for a session. Instead, where presenters need to gather information from members in advance of a conference program, NALP recommends the use of targeted outreach calls to garner more meaningful information. Each year more than 100 NALP members serve as volunteer speakers – the conference wouldn’t be the same without these members willing to share their expertise with their peers! Please note that member and affiliate member speakers are responsible for covering their own conference registration and travel expenses. If you are submitting a proposal on behalf of a NALP Section or Interest Group, indicate that on the RFP form. Please coordinate proposal submissions with other members of your section. NALP will inform Section chairs which proposals have been submitted for their section after the RFP deadline and which proposals were accepted after decisions are made. •	Successful sessions usually teach NALP members how to implement a program/service/etc., at their own organization, without necessarily hiring consultant assistance. Ultimately attendees might decide to hire someone outside the organization to facilitate or implement a program, but selling your services should not be the focus of the program. In some cases, consultants have successfully paired with NALP members to present a session. This is particularly effective when it gives attendees “how-we-did-it” advice from someone in their position. Ideally, proposals should reflect content targeted for NALP conference attendees. 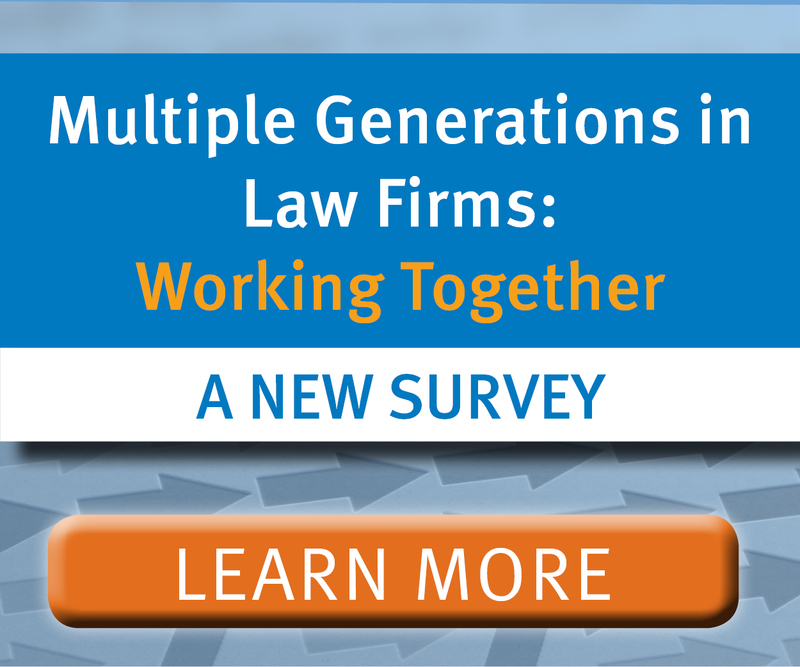 Proposals that appear to be an existing program for a different audience, such as practicing attorneys, are evaluated less favorably. To target your proposal and refine the topic focus, consider speaking with clients and/or past conference attendees to get their feedback. Participants do not react well to outright marketing of services during conference education sessions. An indirect approach to marketing will be much more successful. A well-received session, where participants have gained from your particular expertise, is often the very best way of positioning yourself in the market. Limited travel funds are available for non-member speakers who are not with resource center exhibitors. In consideration of our not-for-profit status, we encourage speakers to support some or all of their travel. The proposal form asks you to indicate the number of speakers who will request travel support funds. For planning purposes, this number cannot increase after program acceptance. Please note that if this field is left blank, we will assume that there are zero requests for travel support, and will plan and budget accordingly. May 17, 2019 — proposals due. Download a Word version of the submission form: The online RFP system does not allow you to save a copy of your work. We recommend you download a copy of the RFP in Word and then type your proposal in word processing software. You can then cut and paste the text into the online system. This will allow you to save a copy of your work, in addition to using spell check and word counts. Submit your proposal(s) online: All proposals must be submitted using the online system. Descriptions for sessions in the 2019 Annual Education Conference brochure (PDF): If you are new to NALP and this conference, you may want to see which sessions were ultimately accepted and/or created for the 2019 conference. Note: You are welcome to submit more than one proposal but must complete one on-line submission before beginning another.